Gone are the days when one had to read through wordy manuals to understand how things work – today, video guides make the learning curves way easier to comprehend. 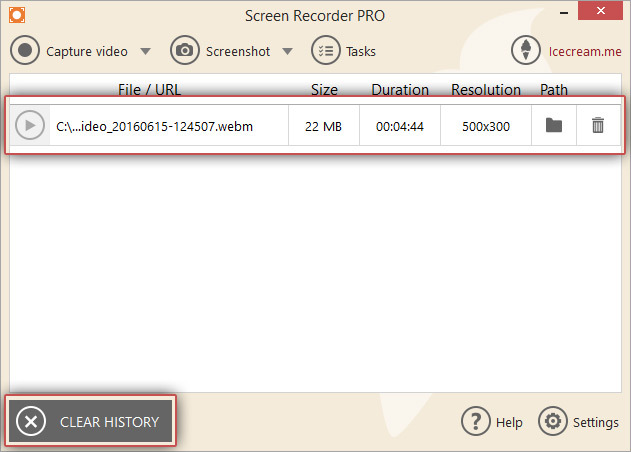 Icecream Screen Recorder is a versatile yet simple application for screen capturing and taking screenshots that offers a wide variety of options without overloading the interface with tricky buttons. 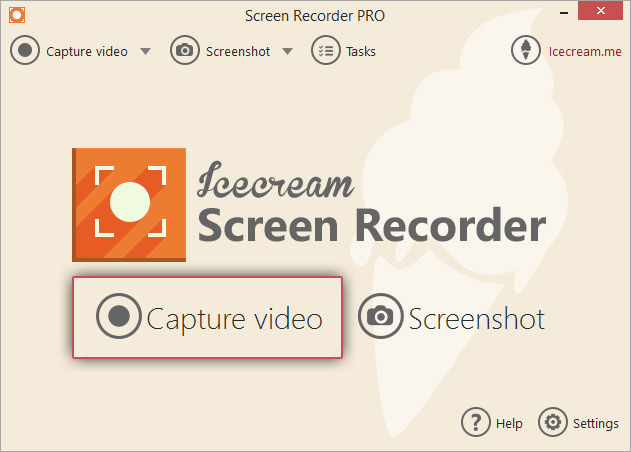 Learn more about how to create a video guide using Icecream Screen Recorder. To download Icecream Screen Recorder, simply click the “Download” button on this page. Save the installation file on the hard drive and activate it to proceed with the installation, which is pretty standard and easily completed in a few simple steps as suggested by the Wizard. Once the program is installed, open it to create a video guide. First and foremost, click the “Settings” button in the bottom right corner of the main window of this screen recording software and tweak the configurations in such tabs as System, Save to, Video, Audio and Hotkeys. You can read more about the customization of the settings of Icecream Screen Recorder in this how-to guide here. 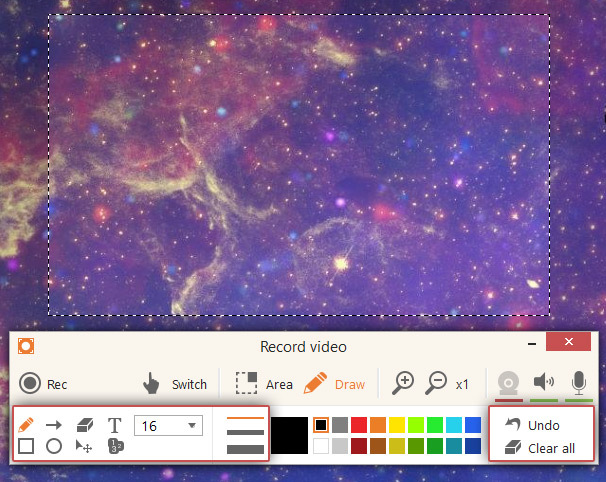 Click the “Capture video” button in the middle of the program's main windows to start selecting the recording area of the video right away. Select the recording area – simply toggle the frame over the area of the screen that should be recorded and release once it’s selected. You may also move or adjust the recording area (make sure that the “Area” button on the recording panel is active though). In here, you can also choose the parameters like custom, full screen, 960p, 720p, 1024x768p, 640x480p, 320x240p, and 160x140p. The “Switch” button will help you activate the desktop while you create a video guide so you can access your computer's facilities, open programs and control the windows. Note that if the “Hide desktop icons” option is enabled in Video tab of the Settings panel of this screen recorder, you won't be able to use your desktop icons as they will be hidden. 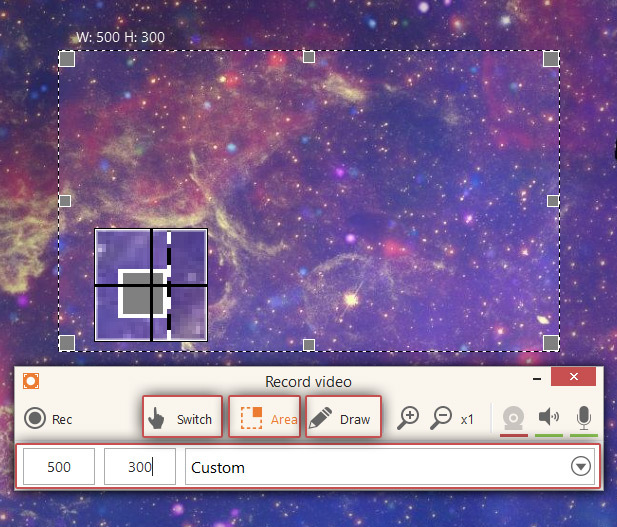 The “Draw” button allows drawing right over the screen and thus makes your video guide more visually comprehensive. Particularly, it's possible to use a regular brush or tools like oval, rectangle, arrow, step tool or text. The “Undo” and “Clear all” buttons are located in the right-hand side of the recording panel – use them to cancel the changes. To add text click the icon representing letter “T”. Next to it there is configuration of the size of the text, there are plenty of various options starting from 8 and finishing with 34. For the text as well as for the other graphic tools it is also possible to select color. When the size and the color of text are chosen, single click inside of the selected recording area to start typing needed text at that place. 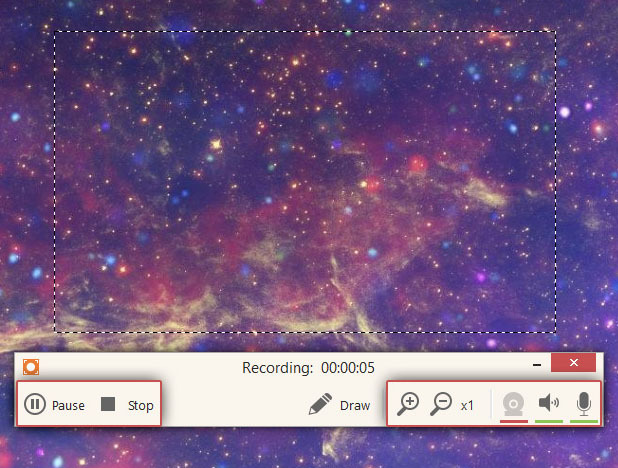 Click the webcamera icon in the right-hand side of the recording panel to open the webcam window and customize its size and the position within the selected recording area. Once it’s all set, click the “Rec” icon to start capturing. If in the Video tab of the program's Settings panel you have enabled the “Show countdown” option, then before the actual recording starts, the countdown starting from 3 will be shown. It’s possible to use all the icons described earlier right during the recording. All the drawings and text will appear in the output video in the same way as they appear on your screen. You may use the zoom in and zoom out icons (magnifying glass icon with a “+” to zoom in and magnifying glass with “-” to zoom out) to enlarge or minimize the recording area. The zoom level is shown to the right of the magnifying glass icons. The adjustment of the sound level of both audio and microphone along with their enabling or disabling is also available during the video recording. Click the “Audio” icon to open the audio control panel and click the “Microphone” icon to open microphone control panel. Pause and resume the video by pressing the “Pause” and “Resume” buttons in the left part of panel. Feel free to set up the screen and finish graphic changes while the video is paused. After resuming the recording, the video will be recorded from the moment it was stopped. When the user wants to stop capturing the video guide, it’s necessary to press the “Stop” button. After that, the program will notify the user by showing the “Video saved” popup window in the bottom right corner of the screen (unless the “Show notifications” option is disabled in the System tab of the program's Settings panel). After that, you can check the file in the program’s window – click the folder icon in the “Path” column in the History panel of this screen recording software to view the file in the containing folder or double click the video to open it in a default player. Press the recycle bin icon at the right side to delete the project or “CLEAR HISTORY” button in the bottom left corner to delete all the items in the list.